Will a Unified Time Zone Work for Indonesia? Indonesia, the world's largest archipelagic country, plans to synchronize its three time zones in October 2012. The business sector, especially travel operators, applauded the plan saying that synchronized time with Asia's financial capitals such as Seoul, Hongkong and Singapore would boost business activities and tourism. However, former Vice President Jusuf Kalla said  that the plan is ‘illogical’ while the Indonesian Council of Ullemas (MUI) said  that change will confuse religious believers. 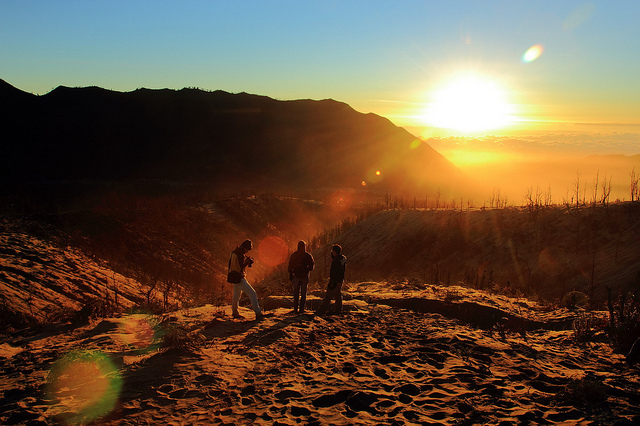 Daytime in Bromo Mountain, East Java. Flickr photo by Robertus B. Herdiyanto  used with permission under Creative Commons. Our fellow Muslims who live in Jayapura Papua for example will have to conduct their Fajr prayers around 3 or 4 AM (GMT+8). […] Geographically, unified timezone isn't suitable to be implemented in Indonesia, where most of its citizens are Muslims. If later on the office and break hours are to be decided by provincial administrators, then why bother with the time zone adjustment. I personally like Jakarta to be on GMT+8. The weather won't be too hot on the way to the airport, on the way home it'll still be daytime but temperate. The same case will apply in other cities in Central Indonesia Time (WIB). But the time zones unification will become a problem to those living in Eastern Indonesia Time (WIT). They'll go to work when the sun is up and come home when the sun is set. I live in East Kalimantan under GMT+8, I was surprised when I visited Surabaya, I had to take my Sahoor (author's note: last meal of the day during Fasting Month, consumed before dawn) before 3:30 AM, because at that time Imsak (author's note: the beginning of fasting) has started. If the unification is the best way for business in Indonesia, I agree (with the plan). The implementation of Unified Indonesia Time (WKI) could bring various implications, at least two of them are serious. First, regarding the Solar time and work period. Solar time is an intrinsic period of the sun due to the earth rotation, the obvious results of this are sunrise and sunset. In Indonesia, the solar times are different in each regions. Although the solar time won't be disturbed by time zone reconfiguration, the application on civil time will create adjustments. We haven't got a clear picture on what would happen if WKI is implemented, especially on two regions  in the westernmost and easternmost parts of the country. WKI discussions should not be initiated only by the economic ministry. The Ministry of Religious Affairs should be part of discussions because WKI would have wide implications in religious aspects (especially for Indonesian Muslims).